Tomatoes from my in-laws’ garden are roasted for soup. Maybe I’m the world’s cruelest vegetarian (nevermind that I’m a meat eater). I love eating vegetables and fruits. I love choosing veggies to plant in the spring. I love vegetables more than meats on pizza (much to my pepperoni-loving husband’s chagrin). Caring for plants, though, that’s where I fall down. True confessions time: I have knowingly let houseplants die. I haven’t weeded my herb garden all summer, and it’s pretty hairy in there. I haven’t watered the garden since I was responsible for it while MVH was traveling for work. MVH is the resident farmer around here, and consequently, I’m pretty hands off. It seems to work OK. MVH brings me summer squash, and I make stuff with it. But he comes from a farming family, and it is a way for him to connect to his roots (yes, that was an intentional plant pun). MVH roots around his parents’ garden. 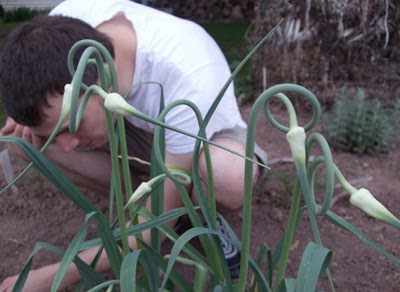 The neat looking plant is garlic! Did you know garlic looked like that above ground? I didn’t. I am thankful that he has a green thumb, and that his green-thumbed parents are eager to share the bounty of their garden with us. That’s how I came into three meaty, gorgeous tomatoes that became soup. The basic soup formula I follow is this: Roast veggies until soft. Puree veggies in blender with broth. Season to taste and heat through. It’s that simple, and the variations are endless. It’s a fun way to feel particularly cookish. Pretty much the only thing I don’t like about soup is you end up dirtying a lot of dishes. Making soup means lots of dishes. From left clockwise, you’ve got the blender, the broth, the warming finished soup, the caramelized onions, and the roasted tomatoes. Here’s a tip from me to you about making soup: Proceed with caution when using the blender to blitz hot ingredients. Hot stuff will expand in your blender, putting pressure on the lid. Sometimes the pressure from hot butternut squash puree will send the lid into the air, spraying thick yellow soup all over your cabinets and ceiling. Maybe you’ll stomp and curse a lot while your husband watches in terror and amusement. Or maybe you’ll take my advice and work in small batches (don’t fill the blender more than halfway) and cover the lid with a towel and HOLD ON. It will jump on you; be ready. Here’s to fall, the beginning of soup season. And soup is a great way to capture the goodness of vegetables (that I didn’t take care of). Makes about 48 ounces (6 8-ounce cups) of soup. 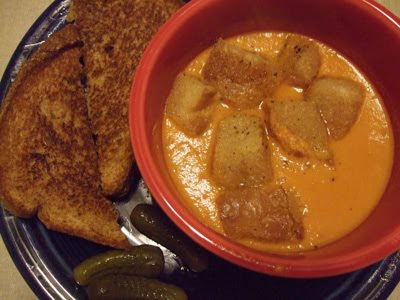 Grilled cheese, a few Milwaukee’s midget dill pickles, and homemade tomato soup. Does comfort food get better? Preheat oven to 350 degrees. Wash tomatoes, pull off stems, and cut into quarters. 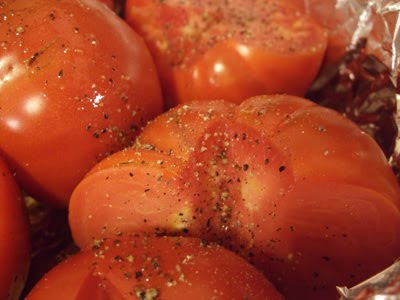 Place tomato quarters in an oven-safe dish, cut sides up. Drizzle with olive oil, and season with freshly ground black pepper, kosher salt, and brown sugar. Place in hot oven and roast for 30 minutes. While the tomatoes are roasting, caramelize the onions. Warm butter in a medium pan over medium heat until lightly foaming. Thinly slice the onions and peel garlic cloves. Add onions and garlic to foamy butter; stir to coat with butter. Reduce heat a touch. Give the onions a stir every once in a while to keep them from burning. You want onions that are soft, dark golden brown, and sweet. This should take about 25-30 minutes and be mostly hands off. 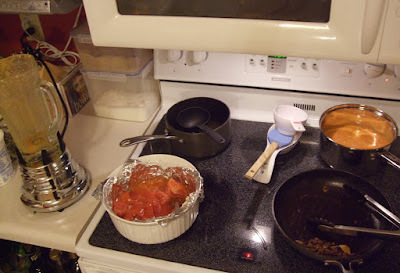 Remove tomatoes from the oven and allow them to cool while the onions are finishing up (about 5 minutes). The tomatoes will have released a lot of liquid. While the tomatoes are cooling slightly, place 2 boullion cubes in a small pot with 3 cups of water. Bring to a simmer to dissolve the cubes, breaking them up with a spoon to release granules. The goal is smooth (not grainy) chicken broth. Once onions are caramelized and the cubes are dissolved, turn off their respective burners and leave the pans in place. Set a medium pan on the stove for the soup. Puree the soup in a blender in three or four batches. (Note: Don’t fill the blender more than halfway, and, to be safe, hold a towel over the top of the blender as it runs. Hot foods expand and spray!) Process a few tomato chunks, about 1 1/2 ladle scoops of broth, about a third of the onions, and a tablespoon or two of yogurt in the blender until smooth and lightly foamy. Taste, and adjust seasoning if necessary. Pour the soup into the waiting pot and turn the burner to low. Repeat pureeing process with remaining ingredients, adjusting seasoning as you go, adding more broth for a thinner soup and more yogurt for a creamier soup. Toss in the cheese rind. Heat the soup through and adjust seasoning to taste. Serve with croutons.